iDiablo is an application that presents an intelligent interface that helps you choose, prepare, execute and track your Crossfit workouts. iDiablo does this by randomly choosing a Workout of the Day, breaking down the WOD to each exercise and tracking your time and/or reps. This app also automatically adds your workout results to a log that also allows you to add notes. 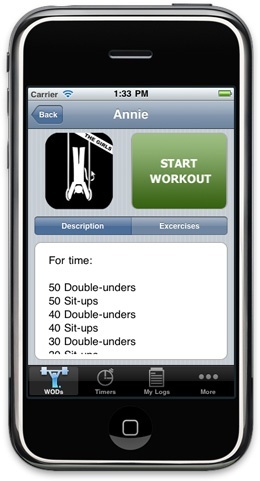 In the Lite Version, it offers 35 WODs with their own unique features that will allow any CrossFitter (beginner to advanced) to choose a constantly varied workout, become proficient with the exercise movements, and track their workout with the aid of interactive screens and audible cues. iDiablo Now Available in the App Store for only $0.99 FOR A LIMITED TIME!